Brazilians love passion fruit desserts, and this easy yet spectacular passion fruit mousse cake is one of their best. Spongy vanilla cake layers are soaked with passion fruit syrup, then filled with an intensely flavored passion fruit mousse. The cake is iced with sweetened whipped cream, and serve chilled. It makes an elegant summer dessert. 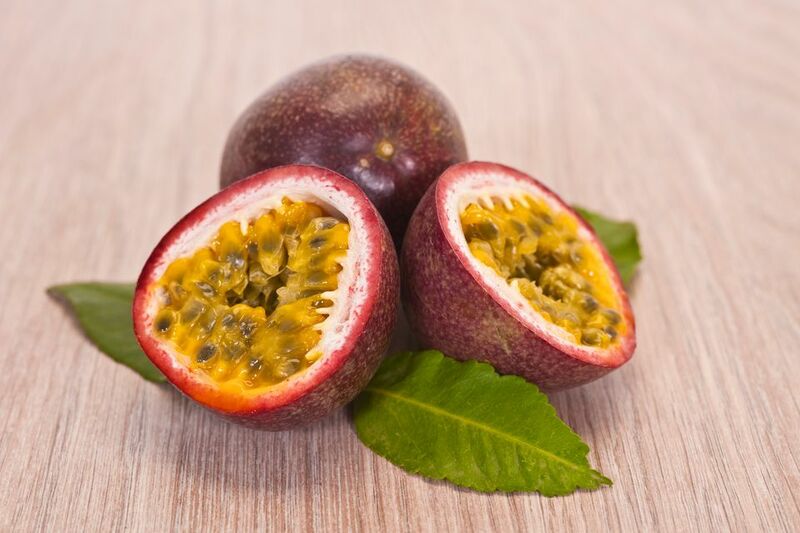 If you can't find fresh passion fruit, use frozen fruit pulp, which you can find at supermarkets (we found Goya brand frozen passion fruit pulp at my supermarket) or Latin food grocery stores. If you are short on time, make just the mousse - it's delicious with fresh fruit. In the bowl of a standing mixer, add the cake mix, 3 eggs, 2 egg whites, 1/3 cup vegetable oil, 1/3 cup buttermilk, and 1/3 cup water. Mix for 2 minutes or until well blended. Line the bottoms of 2 9-inch cake pans with wax paper, and divide the cake mix between the 2 pans. Bake for 20 to 25 minutes, until the center of the cake springs back when lightly pressed. Let cakes cool 10 to 15 minutes in the pans. Run a knife around the edge of the cakes and flip them out of the pans. Set aside to cool. While the cakes are baking, make the mousse: Sprinkle the gelatin over the water and set aside for 5 minutes. Microwave for 15 seconds or until gelatin is dissolved (do not overheat). Whisk the melted gelatin into the passion fruit pulp and set aside. Make the cake soaking syrup: Bring 3/4 cup passion fruit pulp and 3/4 cups sugar to a boil. Boil for 1 minute, and remove from heat. Let cool and set aside. When cool, stir in 2 tablespoons rum. Make the Italian meringue: Add egg whites to the clean bowl of a standing mixer. In a saucepan, bring 1 cup sugar and 1/2 cup water to a boil. Boil for 3 to 4 minutes, until the syrup starts to thicken and the bubbles are popping slowly. Until the whisk attachment, beat the egg whites until soft peaks form. Slowly add the hot sugar mixture to the egg whites. Pour syrup in a thin stream down the side of the bowl to prevent splattering. Work carefully to avoid burns. Beat the meringue on high speed for 2 minutes, then reduce the speed to low and continue to beat so that the meringue will cool. While the meringue cools, beat one cup of whipping cream until very soft peaks form. Do not overbeat. Fold the passion fruit/gelatin mix gently into the egg whites. Do not overmix. Whisk a small amount of the meringue/passion fruit mixture into the whipped cream, then gently fold all of the whipped cream back into the meringue mixture. Slice each cake layer in half horizontally, so that you have 4 layers. Line the bottom of a 9-inch springform pan with a circle of wax paper. Butter the inside of the springform pan. Place one cake layer, cut side up, in the bottom of the springform pan. Brush the cake with 1/4 of the syrup. Spread 1/3 of the mousse over the cake. Cover mousse with another cake layer, and brush the cake with syrup. Spread another 1/3 of the mousse over the cake. Continue to layer, ending with the fourth cake layer. Press cake down gently into the pan. Brush top of cake with syrup. Chill thoroughly, at least 4 hours to overnight. Pop the side of springform pan off of cake in one quick motion. Gently lift ring off, leaving the cake on base. Add sugar to two cups chilled whipping cream, and beat until stiff peaks form. Stir in vanilla. Spread whipped cream around sides of the cake and on top. You can also use a pastry bag with a star tip to pipe the whipped cream onto the top of the cake. Decorate with fruit, and serve chilled.